It's been too long since I posted one of Jim Pobog's sea stories, so I thought I'd share this one, about a mishap he had while tending the boilers. 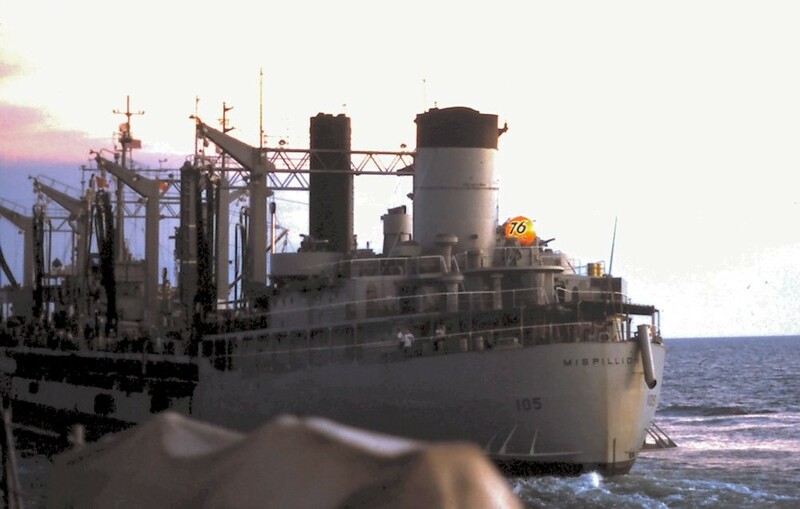 For those who've forgotten, Jim served as a boiler technician (BT) on the oiler Mispillion, off the coast of Vietnam. A view of Mispillion from another ship approaching to refuel. Note the service station ball on the stern. I was not without screw-ups of my own in The Hole.1 There was a very common mistake to make; it seems that at some point in their Navy career, everyone did this…some more than once. The Babcock & Wilcox 450lb. sectional header boilers on Mispillion were fired with NSFO (Navy Special Fuel Oil). At the time, this was the lowest grade of fuel oil, the heaviest and least processed. There were other grades that we carried as cargo for replenishment of other ships. This oil when cold (a relative term) is very thick, almost like tar. Before it is piped to the boilers it is run through a heater and its viscosity becomes very much like kerosene. It doesn’t look like kerosene however, it is extremely dark brown, almost black, and hence is usually called “black oil”. After the oil is heated it is distributed to each boiler by a separate line, and at each boiler, to each burner by a separate line. All of these lines can be isolated with their own cutoff valve. This gooseneck was in turn placed into the burner/air register assembly in the front of the boiler and was secured with a yoke and screw clamp. The curved neck had a convex surface that fit against the concave surface of the oil feed line. These surfaces were brass and sometimes slightly marred, so we would make little scrap paper gaskets to help make a seal that wouldn’t leak. The screw clamps had a “T” handle and were the standard “righty tighty, lefty loosey” thread. Because even when tightened hard on the paper gaskets the joint would leak slightly, there were stainless steel drip pans along the front of the boiler face. Part of the job on watch was to keep the drips to a minimum, and the pans cleaned. One particular Sunday morning, and I remember it was a Sunday because everyone not on watch had the day off, I was on watch when I noticed that one burner on boiler #4 (port side aft) had developed a bit of a leak, a moderate drip…drip…drip. You don’t let these things go because beside the mess they make, it’s also a fire hazard. Well, I was an experienced boiler operator now, so with chest suitably puffed out, I trotted over to the leak and hit the screw clamp. The problem was that I hit it lefty loosey, not righty tighty. The fuel oil in the line right there is 150 degrees F., and under 300 psi. pressure. The spray hit me square in the face and instinctively my hands went to my eyes yet instantly back to the screw clamp and hit it shut hard. As was usual, I did not have a shirt on and was virtually black from head to foot. I was absolutely soaked in oil. After a few moments I got enough oil out of my eyes to be able to see through a slightly blurry film. The oil had sprayed for only a very short time, about the count of “one thousand one”, but what I saw was amazing. The entire front face of the boiler was black, about 10 feet wide and 15 feet high, and because of the air blown by the ventilators, there was oil around the corner on the left side. Worst of all was the pool of oil that was sloshing around on the deck with the motion of the ship. I had just ruined the rest of my day off, and ruined the day off for several of my crewmates. This could have been a situation for me like Dan Gary flooding After Steering, “Clean it up yourself”, but this was also a safety issue with the severe fire hazard. Word was sent up to the living quarters and several guys came down to help me. There may have been more, but I remember Wayne Rankin, Tom Wigmore, and Graham Symons coming to help. Being soaked in oil, I couldn’t even function until I had cleaned up. The dungarees got a float test,3 and a hot shower with lots and lots of soap got most of the oil off my body and out of my hair. I was then able to join in the cleanup efforts. The cleanup took several hours and it would have taken forever for me to do I by myself. I am very thankful and indebted to my shipmates who helped me that day. I feel your pain! Not really, kinda funny. Screwed up myself and got handed the job of cleaning the after head on a Gearing after being in 30ft seas. People can puke on the overhead, if the roll is right. Would have loved to hear the comments from the rest of the guys. Puke on the overhead? Wow. That's an impressive amount of roll. And probably an impressive amount of puke, too.